Chinese premier urged North Korea on Wednesday to desist from firing a long-range missile, while South Korea called on the United States to talk directly with North Korea to forestall a launch. Premier Wen Jiabao said China was paying close attention to information that North Korea may be preparing a test-launch and urged Pyongyang to avoid any actions that would aggravate regional tensions and further derail long-stalled negotiations on the North's nuclear fuel programs. "We hope that the various parties will proceed from the greater interest of maintaining stability on the Korean Peninsula and refrain from taking measures that will worsen the situation," Wen said at a joint news conference with visiting Australian Prime Minister John Howard. Wen's remarks Wednesday were the first time the senior Chinese leadership acknowledged concerns about a possible missile launch in the two weeks since intelligence reports detected North Korean preparations. 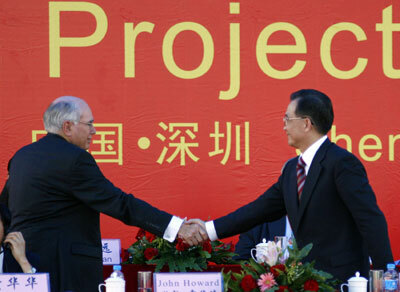 "No country in the world has a greater influence on North Korea than China has," said Howard, in Shenzhen to inaugurate deliveries of Australian natural gas and discuss a free-trade agreement with Wen. According to intelligence reports, the missile, a Taepodong-2, was being fueled at a launch pad on North Korea's northeastern coast. A US government estimate puts the range of the Taepodong-2 missile at between 5,000 and 7,500 miles, making it capable of reaching the United States. A senior South Korean official urged Washington to talk directly with Pyongyang, a demand a North Korean diplomat has hinted at but that the Bush administration has refused.